It is a word which connects the words, phrases, clauses or sentences and at the same time brings about relationships between the elements jointly. Some of them are and, but, unless, lest, therefore, otherwise, when, however, since, because, yet, till etc. Eg: Democracy is known as the government of the people, by the people and for the people. Eg: He is honest though he is poor. Eg: Mohan and Ram went out for a shopping. They are used in pairs in order to show the relationship between the ideas expressed in different parts of a sentence. Correlative conjunctions join various sentence elements that must be grammatically equal. 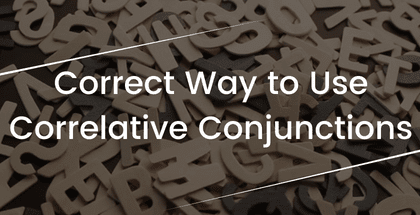 The most commonly used correlative conjunctions are both….and, either….or, neither…nor, hardly….when, not only……but also etc. Correlative conjunctions should be followed by the same grammatical construction. Thus, whenever possible, parallel construction should be employed when correlative conjunctions are used. Many violations of this rule can be corrected by rearranging the sentence. The repetition of a particular grammar construction is often referred as parallel construction. I am neither happy nor excited. The resort contains open bars, swimming pools and a library. The common Correlative Conjunctions along with examples are given below. Used in a sentence in the affirmative sense when referring to a choice between two possibilities. Either Ram or Shyam must have done this mischief. I will either go for a picnic or take rest. Used in a sentence in a negative sense when trying to say that two or more things are not true. Neither Ram nor Shyam has passed the test. She is neither rich nor good natured. Both is paired with and to add emphasis to two coordinated elements in a sentence. Both is a focusing adverb and is a coordinator for addition. Verb will be in plural form. The formal rule is to use whether when you are showing two alternatives as possible. Whether can generally stand alone when its clause is functioning as a noun, but not when the clause is serving as an adverb. Or not is necessary when the phrase whether or not means regardless of whether. I do not know whether my father is arriving by the 8o’clock flight or 9o’clock flight. Not only and also are paired with but to add emphasis to two coordinated elements in a sentence. Only and also are focusing adverbs, not is a negative adverb and but is a coordinator for contrast. Here verb agrees with the second noun. She not only wrote the screenplay for the movie but also acted a role in it. She is not only clever but also intelligent. Such is placed before a modifier and noun to intensify the quality of the modifier. The emphasis within the noun phrase expresses a remarkable situation. This clause can stand alone as a sentence or it can be paired with that + clause to express a cause and effect relationship. It was such an interesting story that I read it in one sitting. Such was the weather the whole of today that I decided to stay indoors. We use as + adjective/adverb + as to make comparisons when the things we are comparing are equal in some way. The world’s biggest bull is as big as an elephant. We use not as … as to make comparisons between things which aren’t equal. Ram has not as tall as Shyam. She is not singing as loudly as she can. As...so expresses a mirrored relationship that otherwise might be merely comparative. Actions joined by as/so are more closely inter-connected, and inter-dependent. As/so can imply in the same manner as, for the same reason as, in the same time as, etc. As interest rises, so does my blood pressure. To refer to something happening immediately after something else, we use scarcely/hardly … when. We move hardly and scarcely to front position and invert the subject and verb. He had hardly begun to work when it started raining. Scarcely a day goes by when they don’t talk to each other. We use so that and in order that to talk about purpose. We often use them with modal verbs (can, would, will, etc.). I left home early so that I would not miss the 7o’clock train to the city. The meeting will take place between 5 pm and 6 pm. The Ministry plans to construct between 50 and 60 cyclone shelters. There are as many chairs as there are students. They try to give them as much as freedom as they can. We use from … to.. to talk about ranges of different things, to talk about a change in the state of someone or something. Application will be issued by the college from 9 am to 4 pm. No sooner had I reached the station, than the train arrived. No sooner had I finished my studies, than I got a good job.